for the liver normal functioning and the protection of hepatocytes. Pleasant taste, well tolerated and easy for administer in children over 1 year old. Ingredients: purified water, sugar, sweetening agent (sorbitol), choline bitartrate, milk thistle extract, thickening agent (xanthan gum), preservatives (sodium benzoate, potassium sorbate), trans-anethole. Energy value: 10.84 kcal/5 ml syrup. 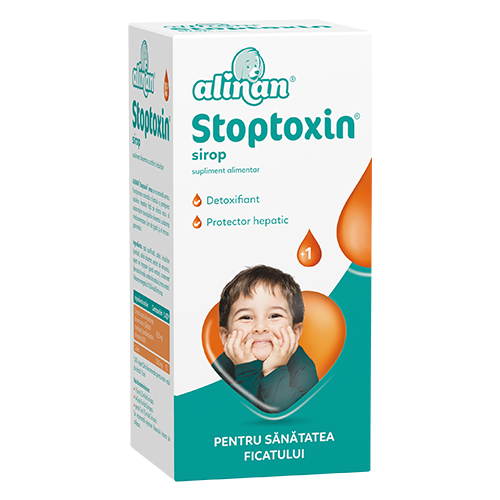 Alinan Stoptoxin, syrup contributes to the intake of choline and flavonoids, exerting a strong antioxidant effect. It is recommended for the normal functioning of the liver and the protection of hepatocytes against the deleterious effect of toxicants (food additives, drugs, cigarette smoke) and microbial agents. - children over 7 years of age: 7.5 ml x 3 daily. Attention: shake the bottle well before each use! - This product is a dietary supplement and does not replace a balanced diet and a healthy lifestyle.